I just started printing blog posts for my project life album, and I'm so glad I decided to do this. When I'm laying out my photos to put in my album, I naturally start thinking about the memories that go along with the photographs, and now that I blog, I start thinking of blog posts that I wrote to go along with these photos. For those of you that don't know, I do a very loose form of what's called Project Life. It was apparently developed to make scrapbooking way easier, but I couldn't even manage that, so not only did I downsize my album (I went from 12x12 to a 6x8 project life album), but I only document month to month, rather than week to week as it was originally designed to do. I was flooded with the memories of this moment in time one year ago - I wrote a blog post about being a graduate student's wife on my old blog. It was personal, and emotional, and reminded me of how much I was hurting last year as I not only felt the strain on my marriage as my husband was consumed by a demanding Physics graduate program, but also by the overwhelming confusion of how I was to go about supporting him through a degree he himself was struggling to to stay devoted to after making a stressful switch from Engineering. I wanted to go back and print the blog post because it was so important for me to write it. It was therapeutic, it reminded me of all my husband's amazing qualities, and it opened up conversations with women who felt just like me and understood me. That blog post was an important part of me that I wanted to preserve. Sometimes, I feel we rely on the internet for preservation way too much. If you haven't noticed by now, I used to blog elsewhere. Believe it or not, I've blogged many a places before Home Says Hello, before I even really understood what blogging was. But you know what? Some of that really old writing is lost to me now...and maybe that's a good thing if my memory serves me correctly, but it would still be nice to have access to it all. That's why I'm printing the blog posts (or hand copying when I feel extra creative and ambitious) that matter for my photo albums. I want to remember what I wrote years down the road in case something ever happens to my old blog, even though I plan to leave it up for as long as blogspot exists. I know that blogging can seem like form of digital scrapbooking; it's filled with stories, thoughts, photographs and insight, but for me, nothing beats the tangible at the end of the day. As a photographer, it's always funny to me how clients can get so hooked on having access to those digital files. I know that the files are important so you can continuously make prints and other little photo displays as long as you want, but it's always a wonderful experience when I put a physical photograph in their hands and all of a sudden, they start referring to it as "art." It's no longer a file to them. They start treasuring it, talking about how they want to display it, who they want to see it, including those that haven't even been born yet. I love that. They start treating it like an heirloom. 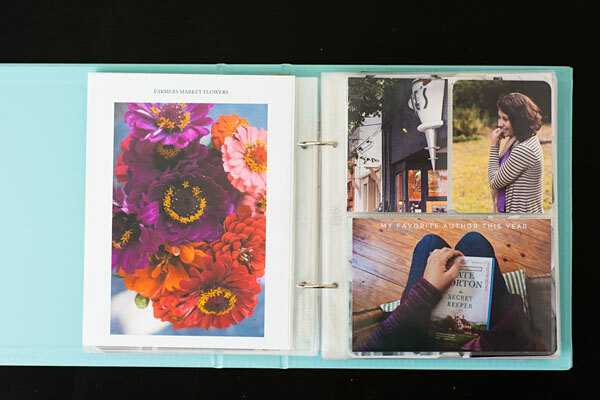 Do you scrapbook or keep a tangible photo journal? If so, have you ever included some memorable blog posts of yours in it?